Americans are amazingly tolerant of diverse religious beliefs. Religious con men, charlatans, self-appointed messiahs, frauds, thieves, bigots, crack-pots and cranks have flourished in America as nowhere else. One such religion is Christian Identity. Incorporated in Los Angeles in 1948, Wesley Swift’s Church of Jesus Christ Christian was initially a racist sect which became Christian Identity. The central belief in Identity doctrine is the existence of two races on earth: a godly white race descended from Adam and a satanic race fathered by Satan. In 1970, Swift died, and Richard Butler assumed control and moved the church to Idaho, where he renamed it Aryan Nations — Church of Jesus Christ Christian. The function of religion in the lives of these men was to provide a theological justification for their racism and anti-Semitism. Stated another way, racism and anti-Semitism were their religion. The Identity movement was the glue to hold together racist ideology in the United States, and is the inspiration for America’s present white supremacist movement. Baldly stated, the white supremacist movement seeks to undermine federal authority and bring about the collapse of the United States of America. The destruction of federal power is the prerequisite to establishing a new racial nationalist state. It is highly unlikely that such a thing is within the means of the small number of militant racists, but it is certain that they will continue to use all means at their disposal to pursue that unrealistic goal. For readers who might wonder why I make a big deal of “the appalling disrespect of Pacific International Terminals and BNSF Railroad toward the citizens of Whatcom County and Lummi Nation over the last five years, as well as the reprehensible behavior of Gateway Pacific Terminal spokesman Craig Cole” in my op-ed at Cascadia Weekly (Apr. 13, 2016 issue), the short answer is my twenty years of experience dealing with violent white supremacy instigated by industrial developers, a.k.a. Wise Use terrorism. While some might think that “the sinister desecration of the sacred Lummi burial ground at Cherry Point in the dark of night” or “the lavish funding of Tea Party-led PACs run by KGMI hate radio hosts” or “the repeated corruption of elections year after year through money-laundering with the Republican Party” or “the intimidation and libeling of journalists that exposed their ongoing nefarious deeds” or “promoting interracial discord and anti-Indian resentment” is no big deal, allow me to explain why I think it is. As you can read in my comment on a March 12, 2016 news story at Northwest Citizen, Sandra Robson, a former correspondent to Whatcom Watch, was recently named the Paul de Armond Citizen Journalist of the year for outing Pacific International Terminals and BNSF Railroad, who financed a CERA-promoting, Tea Party led-PAC to attack Lummi Nation for its opposition to the proposed Gateway Pacific Terminal coal-export facility. CERA, for those unfamiliar with the acronym, is Citizens Equal Rights Alliance, “the Ku Klux Klan of Indian country”. Paul de Armond, former Public Good Project research director (who passed away in 2013), in the 1990s contributed to the apprehension of people engaged in violent intimidation of Indian treaty proponents and human rights activists. Seven of the white supremacist militia members Paul (and I) helped expose were, in 1997, convicted in U.S. District Court in Seattle for manufacturing bombs and machine guns to commit murder. The militias had been hosted in Whatcom County by Wise Use organizer Skip Richards, a paid agent of the Building Industry Association of Whatcom County. 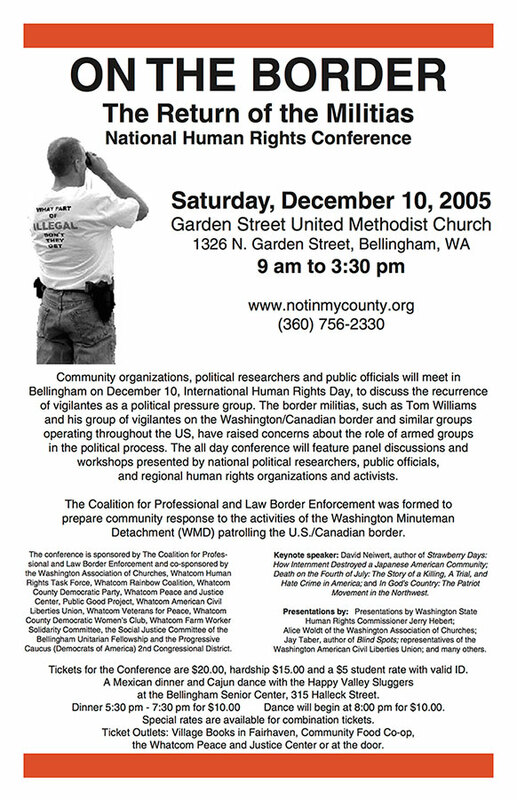 More recently, Mr. Richards and Minuteman militia member Tom Williams of Lynden were the organizers of the April 6, 2013 CERA anti-Indian conference in Bellingham, Washington. In February 2014, Sandra Robson was threatened with a SLAPP suit by Gateway Pacific Terminal spokesman, Craig Cole, over her January 2014 Whatcom Watch cover story. In October 2015, Robson came back fighting with an IC Magazine feature story. The full story of this injustice, perpetrated by some of the largest corporations in the United States, is told in my April 2016 Wrong Kind of Green special report. In 2013, Citizens Equal Rights Alliance (CERA), “The Ku Klux Klan of Indian Country”, initiated a nationwide campaign aimed at undermining tribal sovereignty. Special reports by Charles Tanner Jr  and Jay Taber  exposed the April 6, 2013 CERA Northwest Round-Up Regional Educational Conference held to teach local officials and citizens how to take on tribal governments. Andre E. Johnson, writing at Religion Dispatches, reminds us that “Jesus could not have been white”. Although most Christians in America grow up looking at images of Jesus as Scandinavian, the reality is that he was Palestinian. So why don’t Bible-thumpers in Alabama have Jesus pictures on the wall that look like Yasser Arafat, whom I personally think looks kind of like Ringo Starr? Well, the short answer is that it doesn’t sit too well with white supremacists’ self-image of holier-than-thou antebellum notions of race. Why the big deal? Well, as Johnson observes, White Jesus makes it possible for the devil to be Black. Meanwhile, Hollywood and churches continue propagating the White Jesus myth. Call it an identity crisis. Chip Berlet recounts the history of slavery in Charleston, and how American slaves and slave owners reacted to the slave insurrection in the French colony of Haiti, prior to the US Civil War. Daniel Tseghay’s review of Red Skin, White Masks by Glen Sean Coulthard illuminates the fraud of reconciliation, characterized by the accommodation forced on Indigenous nations by modern states. This violent transformation of noncapitalist forms of life into capitalist ones, quotes Tseghay, is a structure, not an event. Challenging the disingenuous politics of recognition — which includes transfer of land, delegation of self-determination, and economic development initiatives from the state to Indigenous communities — “do little more than reproduce the systems of power they claim to uproot.” Integrating Indigenous governments into the resource-exploitation economy, he notes, signifies the defeat of Indigenous peoples.